Despite dating back to the 1980s, adventure games were practically invented for the iPad (and iPhone, though the larger screen is better). Even with a mouse, games such as Monkey Island and Sam and Max were about poking and prodding your way through jokes, puzzles and brilliant dialogue. Now, you can do it with your finger. As a very quick primer, adventure games are primarily about puzzles, exploration and solving problems with a mix of random junk in your pocket and the power of twisted, but hopefully logical, lateral thinking. To get past a guard, for instance, a true adventurer wouldn't pull a gun, but find a way to make the phone behind him ring as a distraction, or possibly put a cuckoo clock in front of the nearest fire alarm trigger to create an impromptu timer. This is probably why you never see news reports about adventure gamers going crazy, though there are probably a few carefully protected behind padded walls even now. The Secret of Monkey Island (£1.99, iPhone; £2.99, iPad) and its sequel, Monkey Island 2: LeChuck's Revenge (£1.99, iPhone; £2.99, iPad) are the most famous of all time, and not a bad place to jump in. 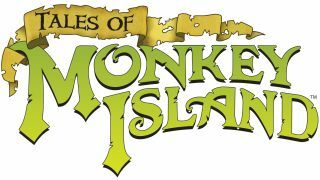 They're the story of Guybrush Threepwood, a would-be pirate seeking his fortune in an oddly modern version of the Caribbean, with the second especially a classic of the genre. It's a world where swordfights are based on duelling insults, a good salesman can sell second-hand coffins, and a squirt of root beer can get rid of even the toughest ghost pirate. These iOS versions feature beautiful updated art - though if you want the original pixels back, just swipe two fingers from right to left. Both games also now have full voice acting, and a built in hint system… which you will likely need. The first game isn't too tough, but the sequel has some tricky bits. Broken Sword: Director's Cut (£1.99, iPhone; £1.99, iPad) is a more epic kind of adventure, but still with a sense of humour, that's also seen new life on iPad. You're George Stobbart, an American tourist who almost gets killed when a clown blows up the café you're sitting outside - yes, really - and you find yourself getting sucked into one of those classic historical mysteries involving the Knights Templar and European mythology. The funnier, but scrappier sequel, Broken Sword: The Smoking Mirror (£1.99, Universal) is also available on iOS. From a slightly more obscure corner of the genre, King of Dragon Pass (£6.99, Universal) makes for an interesting change of pace. It's a mix of simulation and 'Choose Your Own Adventure', with your goal as King being to keep your people safe, well-fed and, if possible, happy. It's not for adventure purists, perhaps, but the heavy focus on storytelling over raw statistics makes it as close as any strategy game has ever gotten. Finally, as far as the nostalgia side goes, you mustn't miss The Last Express (£2.99, Universal). Set on the Orient Express on the eve of World War I, you're a fugitive doctor who boards the train and immediately gets caught in a murderous mix of mistaken identities. It's a great - if slow-paced - game, notable primarily for running in real time. Much of the game is spent simply overhearing conversations in a variety of languages (not all of them subtitled) and figuring out their secrets before anyone manages to stop the train reaching Constantinople.